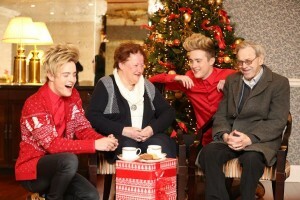 ALONE, the charity that supports older people in need to age at home, are delighted to announce that pop duo Jedward will be donating all Christmas sales from their single Leave A Mark to assist ALONE’s work with older persons. Jedward, ALONE’s Christmas Ambassadors commented, “We really support the important work that ALONE does, so we’re thrilled to announce that we will be donating all proceeds from our single Leave A Mark to ALONE for the months of December 2015 and January 2016. We hope that everyone will go onto iTunes and download the single to help support ALONE’s vital services. We have always been raised to respect and value older persons, we hope that by working with ALONE we can help make Christmas a little less lonely for isolated older persons”. Jedward’s single Leave A Mark can be downloaded from iTunes for €0.99 cents. The music video can also be viewed on YouTube.